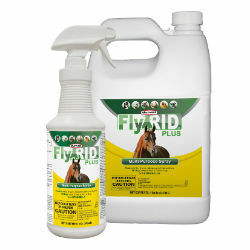 A multi-species, multi-purpose insect control spray that provides powerful yet safe protection against harmful pests. This ready-to-use permethrin product is for use directly on animals (horses, dogs, goats, sheep, hogs, beef and dairy cattle), their premises (barns, stables, pet beds, porches, poultry premise sites, garages, etc.) as well as other indoor/outdoor applications. With citronella. Convenient, easy-grip bottle. Powerful protection that’s safe, effective and economical. Protects from: Horse flies, horn flies, face flies, house flies, stable flies, deer flies, mosquitoes, gnats, fleas (adult and larva) and ticks, cockroaches, spiders, ants, crickets, scorpions, millipedes and centipedes, bed bugs, and mites.